We take reservations for larger parties, maximum 25-30 people while our restaurant is open for regular service. We have bar-height tables available for large parties with bar stool seating. To make a large party reservation, please call the restaurant at 617-338-8585. A menu can be pre-selected for your group, based on your preferences or you can order off the menu at the time of your event. 1. Family style sit down dinner with an hour long cocktail reception as your guests are arriving, for up to 60 people. The menu options are all subject to change based on availability of ingredients, as well as you and your group's preferences. 2. Cocktail reception-standing with substantial hors d'oeuvres in a passed, mix-and-mingle format, for up to 90 people. Our standard event time frame is 4 hours, depending on the start time. Typically events run 6pm-10pm, but modifying the time is a possibility. We have the privilege of working with our neighbors at the Boston Button Factory. 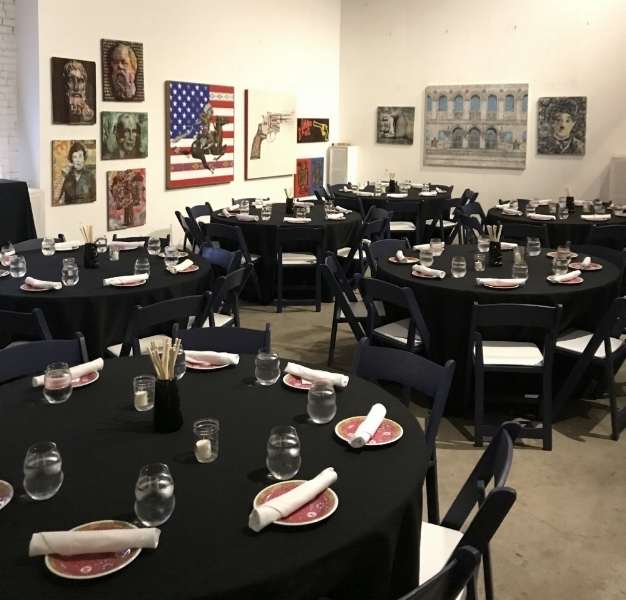 The space is rented for $1500 and we are able to host all types of events including birthday parties, wedding rehearsal dinners, business dinners, business holiday parties and more. -If you are interested, please give us all possible dates so that we can check with the owners of Boston Button Factory. -Pricing of an event can range from $8,000-$15.000 based on 50 guests.